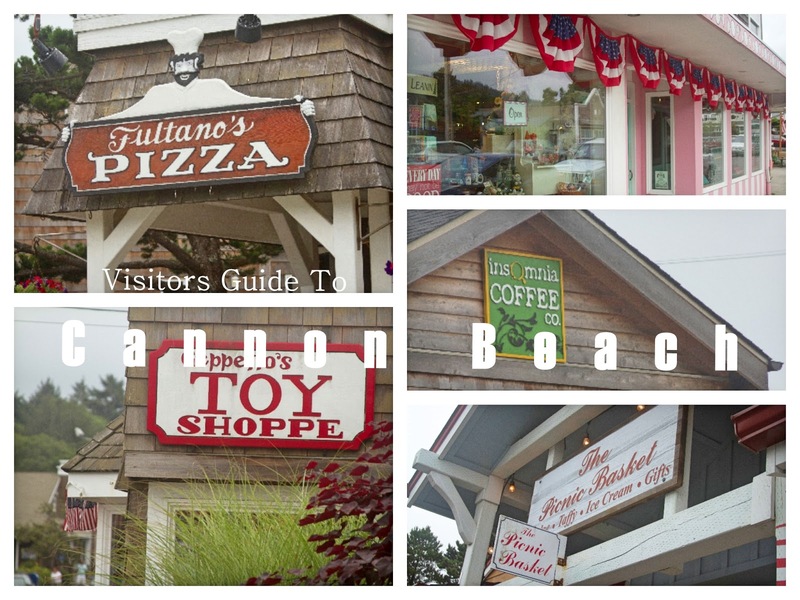 We visit Cannon Beach every year and every year there is something new to look at, do and eat. Over the years we have been to many establishments and had good and bad experiences alike. I have compiled a list of places we've been around town and would recommend to anyone traveling down the Oregon coast soon. Pelican Brewing - This place has only been open in Cannon Beach for three months, but it is an excellent place to eat. The pricing ranges anywhere from $10 a plate to $25 a plate and the kids meals are around $8, but the food is amazing and well worth the cost. We took the kids here for lunch when we arrived and were very impressed. My husband got the 14 hour smoked Tri Tip the first time we went. I tried it and it was extremely tender and full of flavor. 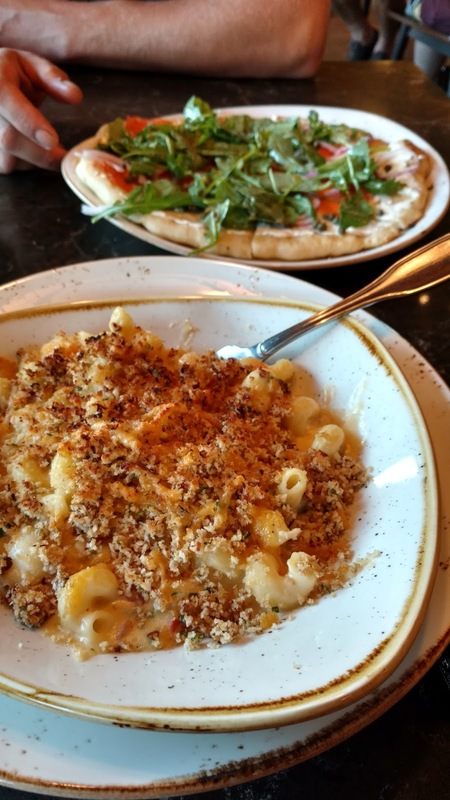 The second time we went (For our 10 year wedding anniversary) My husband got the Salmon flat bread which was like a pizza and I got the most amazing mac and cheese ever. I loved it. They also brew their own beer, and if you have to wait for a while for a table (Which might happen on a Friday night around seven) you can grab a pint at the front counter and sip it while you wait in the beautiful summer air. The layout of the restaurant is open to the sea air, with large garage doors that they open all around the building. They also allow dogs out on the patio while you eat (But not inside) and the bar is open seating if you don't want to wait for a table. This is a great place to checkout (Even with kids). You will not be disappointed. Mo's - One of my favorite little place to eat. Mo's at Cannon Beach. Its just south of town in Tolovana. They have some of the best clam chowder on the coast and the restaurant sits right on the beach, so you get a great view of the ocean with your dinner. This is definitely a must. My family goes every time we visit and we always have a great time. The price is decent from $10-$25 but that seems to be the norm for a good sit down restaurant in the area. Kids meals are a good price around $6 and they have menus to color. 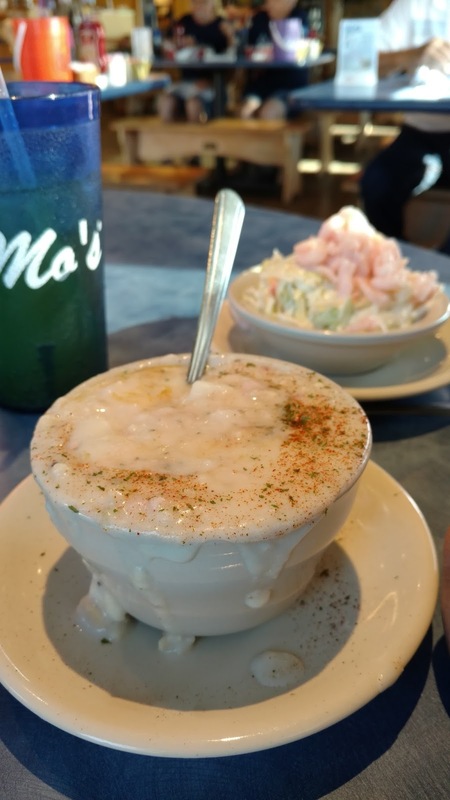 My husband always loves the clam chowder and shrimp coleslaw (Pictured to the left). I tried the fresh tuna salad sandwich this year, which I've never had before there. It was really good and full of flavor. They took their Neptune plate of the menu, which was a combination of all their seafood treats, but they do have a smaller combo plate that features much of the same things. Their non-seafood dishes are excellent too, so if you're not a big seafood fan like me, you will be able to find something worthwhile to eat. Don't forget to check out the gift shop on the way out the door, you can't miss it and get there early. Parking is extremely limited and it gets busy around dinner time. Ecola seafood restaurant and market - Speaking of good clam chowder, we stopped by this little place on the way out of town to grab some chowder to go. Not only can you eat here, you can also pick up some really good seafood to go. So, if you're staying nearby or want to grab a romantic dinner to take down to the beach at sunset, you should stop at this little place. Fultano's Pizza - Who doesn't like pizza right? If you're looking for just a slice or a whole pizza, this is the place to eat. They have gluten free options as well. Score one for me. And for all you salad loving people out there, guess what? They have a salad bar. It can get a little cramped inside, but they do have out door seating, or you can call them up and have them deliver it to where you are staying. Its a pretty sweat deal. Bill's Tavern - A few years ago, my husband and I were lucky enough to get a night to ourselves for our anniversary. This is where we picked to go. They have a wide assortment of beers, local included and they make a mean chicken strip. 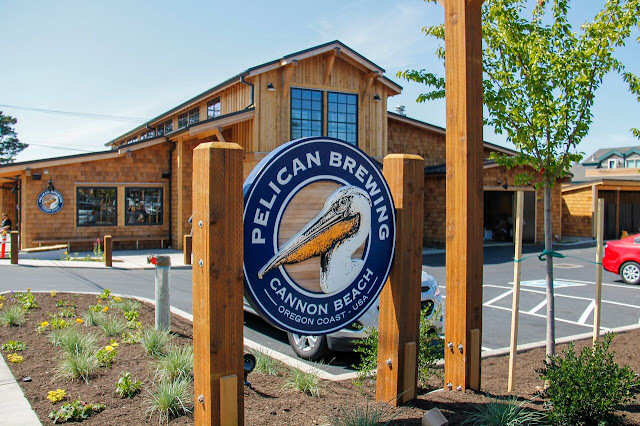 It has all the style of a brew house with the flare of the Oregon coast. I love it and would recommend it to anyone. Tom's fish & chips and Morris' fireside - These are two restaurants that I have not visited but have heard good things about. If you have a review on either of them, please let me know so I can update this section. Maybe i'll get to them next year. 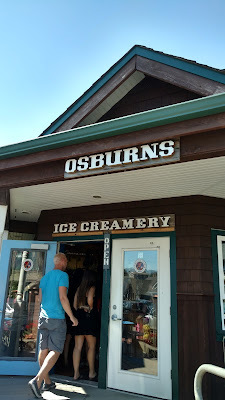 Osburns Ice Creamery - We hadn't really visited this place because in the past they only accepted cash payments and I never carry cash, but this year while my husband and I took a walk on our anniversary (When the temp was 90 degrees by 11am) we needed something cool to get us back to our cabin. We stopped in and ordered milkshakes, They now accept card! If you like marshmallow like I do, they have an excellent marshmallow milk shake that's not too sweat, but its refreshing. A great must with kids (Or without). Their prices are decent so go check them out. Once upon a breeze - Is, as you can see, the oldest kite shop on the Oregon coast. Tucked back into the nooks between shops, this little jewel as some of the most cool kites you will find. We've purchased a few ourselves including a viking ship kite (staying true to our heritage). Its awesome. Check it out, buy a kite and have some fun in the breeze at Cannon Beach. Bruce's candy kitchen - If you are looking for some locally made taffy and other nummy goodies, then check out Bruce's. You can watch them make the taffy from a large window at the north of the building or go inside and be amazed by the wide assortment of jelly beans. A few of my favorite items that are a must when I visit are the dark chocolate dipped sea foam, the all banana runts and the rocky road fudge. My husband is a sucker for the taffy and the kids will eat just about anything you let them. Geppetto's toy shoppe - This shop has been around for years. The kids love visiting this location and frankly, so do I. They have a wide variety of games and toys. My favorite purchase over the years has been the blocks that spell out my boys names. They are pretty cool. My boys picked up some 100% recycled rocket ships that they played with for hours at the cabin and also the entire two hour drive home. Best money I think I spent the entire trip. West of the moon - As far as shopping for myself goes, I always like to visit this place. It has some of the best jewelry in the area and their prices are actually doable. Along with jewelry and trinkets, they have some nice clothing and accessories along with some figurines. 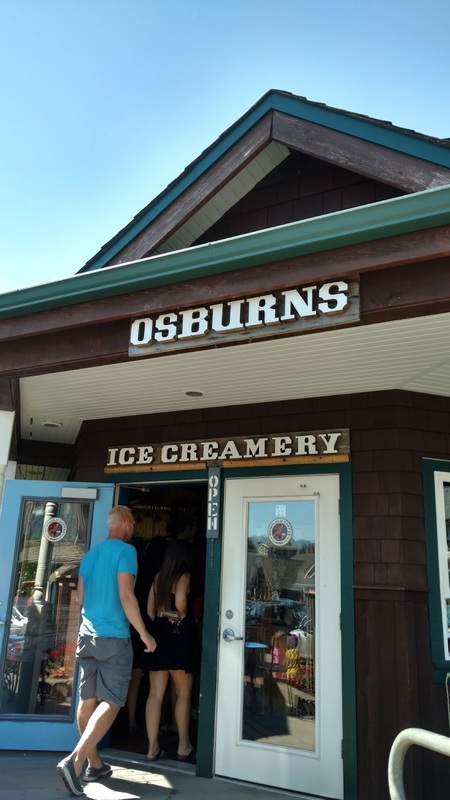 It's a really cool place to look around, so if you get to Cannon beach you must check out this hot spot. I purchased a pair of earrings for my mom for $10 and they came from Ecuador. They were gorgeous! Mom loved them and if I wore earrings, I would have bought myself a pair. Insomnia coffee co. - Half way through your day you're going to need a little pick me up. Check out this coffee shop that is located near the beach and grab yourself a cup. Me, I like to fill my Insomnia tumbler with a nice cool flavored tea, before lounging on one of their many comfie chairs while I read a good book. Make sure this is a stop on your list. Cannon Beach Clothing Co. - So, I know this is a picture of my husband, but this shop doesn't have a plaque outside its doors, so you get to gaze upon what is mine and glance at the hate he purchased at the Cannon beach clothing co. This shop is jam packed full of hip clothing and they rent buggy boards and wake boards for $8 a day. Maybe when my kids are older we can try that. 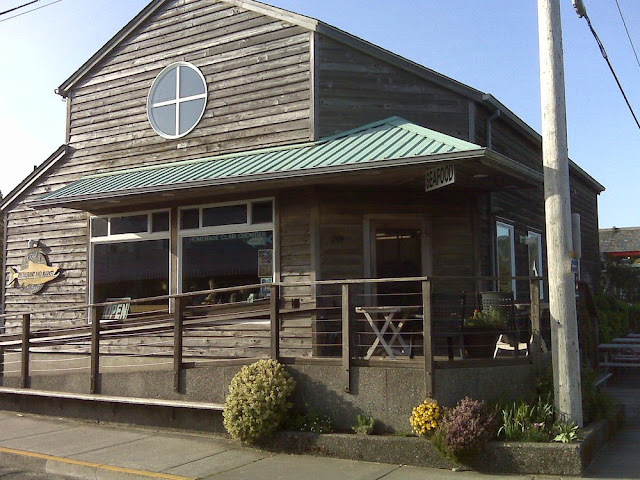 Cannon Beach Book Co. - This is and forever will be my favorite place to visit. They have a nice variety of new books and they are all jam packed into this little gem. I picked up to new reads this year. 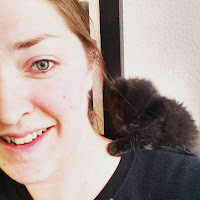 Maggie Stiefvater's Scorpio Races and Garth Nix's A Confusion of Princes. I have yet to read either of them, but they are next on the list. The Picnic Basket - This candy shop is located right next to the book store so it makes it even better for me. It carries taffy and other yummy treats just like Bruce's but it also has ice cream. Its a great location on a hot day. Get a good book and eat some delicious ice cream on their front porch. 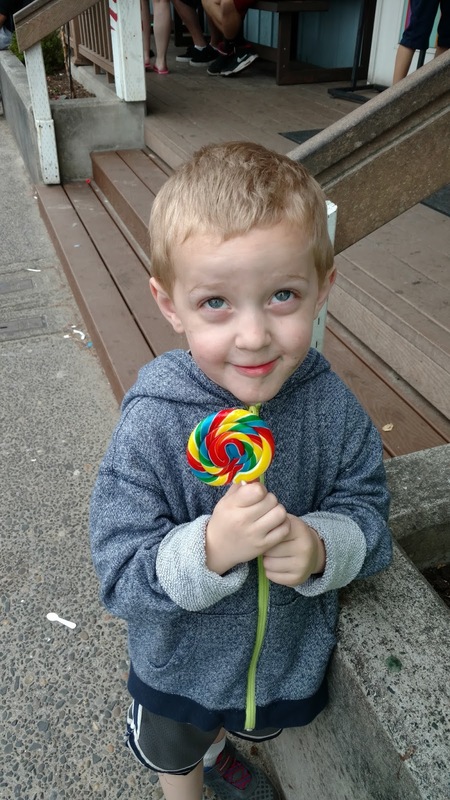 My youngest son found his true love here, a very large lolly pop. It turned out to be more of a mess than in his mouth, but he enjoyed it. I mean, look at that smile on his face, he was over joyed. Updated August 2016.